One area in which we invest a lot of time with our customers is educating them on the importance of change management and user adoption. Training, learning and development doesn’t end when the training program concludes; it’s only just begun. In fact, the real work, the heavy lifting, begins once your learner or learners have completed their training. Providing your learners, whether they be front line managers, salespeople or recruiters, with regular and consistent opportunities to practice applying the skills promotes retention. Learners only change their behavior when their direct managers and leaders provide continual reinforcement through a user adoption plan that includes a series of communications, tasks, events and activities before, during and after the program concludes. Sales enablement has grown dramatically over the past few years. In 2013 less than 20% of companies dedicated resources specifically for sales enablement. Yet by the end of 2017, close to 60% of companies were focused on this vital business function. This is one of the most remarkable sales enablement statistics, and CSO Insights expects this figure to continue to grow rapidly. But is sales training and sales enablement really that important? 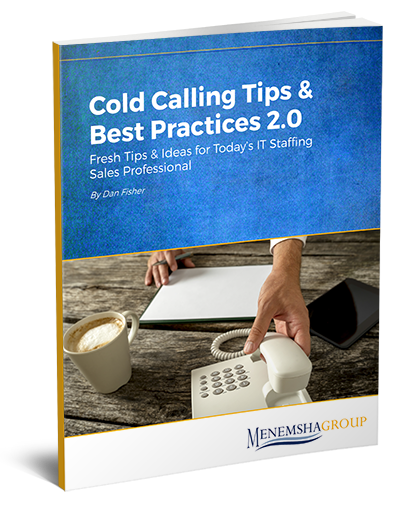 Can it really make a difference for your IT staffing organization? The short answer is YES. But I will will let the industry statistics do the talking. I’ve compiled relevant research on sales training and sales enablement that shows not only how important it is to prepare your sales reps for success, but to consistently reinforce training through sales enablement tools, coaching and user adoption and change management. Developing, delivering and maintaining training programs can be time-consuming and costly. Knowing when to relinquish control and when not to can be an essential part of creating a skilled workforce. Whether the goal is to attract new talent, retain highly qualified employees or develop an internal path to leadership, companies looking to create educational or coaching programs can either go it alone or, like most business processes these days, outsource part or all of the training function to a third-party. There are benefits and drawback to both approaches, of course. Knowing the goals of your program will help you determine whether to rely on in-house expertise or go out-of-house to a contract training company. If you and your staffing staffing firm are looking to implement a training program or hit the "reboot" button on your current training program, consider the following 10 questions: Is there someone in your organization who possess the skill, knowledge and expertise to script word-by-word your sales training material? Recruiter training material? This includes but may not be limited to objection rebuttals, how to open a sales meeting & cold call, how to negotiate, etc. Is there someone in your organization who has the time to script the content, create the videos, quizzes, exercises and role play scenarios? Is there someone in your organization who can physically model the desired sales and recruiting behaviors by recording themselves in front a video camera for team members to watch, analyze and then adopt those behaviors? Does someone in your organization understand microlearning best practices and possess the instructional design skills to put your training content in a format that is engaging for your learners? Does someone on your staff possess the software and skills to create and edit training videos? Does the person creating your training material truly understand the common challenges and pain points your recruiters and salespeople face on a daily basis? If so, can they write (script) solutions for these pain points such as email and voice email templates, playbooks for opening accounts and recruiting passive candidates and rebuttals to common objections and will the sales and recruiting team buy into and commit to this person’s suggestions? Does the person creating your training material understand how to design content that aligns with each stage of your sales and recruiting process including the buyers journey? Do you have a technology platform which includes eLearning best practices such as asynchronous, mobile and microlearning and video based training? If not, is your organization ready and willing to invest in purchasing and maintaining a platform? Does someone in your organization understand change management and user adoption and do they possess real world experience with sustaining change to ensure your training sticks long-term? Do you have a mechanism for creating quizzes and certification exams to track and measure performance and gamify the learning experience? Do you have a way to build and share a library of sales best practices videos for all to learn from? By answering these questions and taking these key points into consideration the answer to whether or not you should build or outsource your training and new hire onboarding program should be clear. Don’t worry, you’re not alone if you are not familiar with the term microlearning. It’s not a new concept, but it has been a hot topic of late regarding employee training and new hire onboarding. While chunking training content down into short bite size pieces has been around for some time, we are seeing an increased focus on microlearning as a significant element of an organization’s overall training strategy and delivery model. Below I share with you eleven benefits of microlearning based training. The first seven benefits focus on benefits to the learners while the last four benefits are benefits to the business. Anyone who has been in sales leadership or sales enablement for any length of time knows that the key to transforming average performers into top performers is sales coaching. Yet the excuses for a lack of coaching including time limitations, other competing priorities, compensation plan, or the absence of a formal coaching strategy are just a few of the common excuses for why front line sales managers and recruiting managers don't coach. Before I dive into metrics to track sales enablement effectiveness, we should first take a quick refresher on what sales enablement is and why it is important. Sales enablement is the process of providing the sales (and recruiting) organization with the technology, tools, processes, methodologies, training, coaching and playbooks that help salespeople sell more effectively and recruiters recruit more effectively.